Shipping UK Mainland is £5, other areas may vary. In a BBC documentary, it shows "Liam's Cocktail Class", where he makes the following drink, which he says "Must be good for everything" and then when drinking it he says "It's Good man". He also swears by it.......a lot !! Polly Guy's Ostlers Apple Cider Vinegar Desserts. Polly Guy is “Come Dine With Me Champion of Champions” winner and local TV presenter. 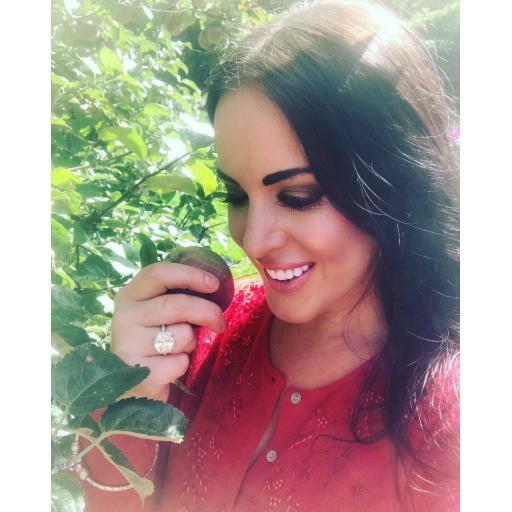 As well as being a mum, Polly is a passionate food blogger and chef and has had considerable success in catering with her chutney and curd business: “Polly’s Pantries”. Sift 225g plain flour into a bowl add 140g diced butter, lemon zest, 1 dsp caster sugar and then rub in with your fingertips until mixture resembles fine bread crumbs, then add your acv, water mixture. Knead dough briefly, then bring to a ball on a well floured surface. Roll pastry out keeping it moving so it doesn't stick. Make sure pastry is wide and long enough to fit your pastry ring. Grease your pastry ring. 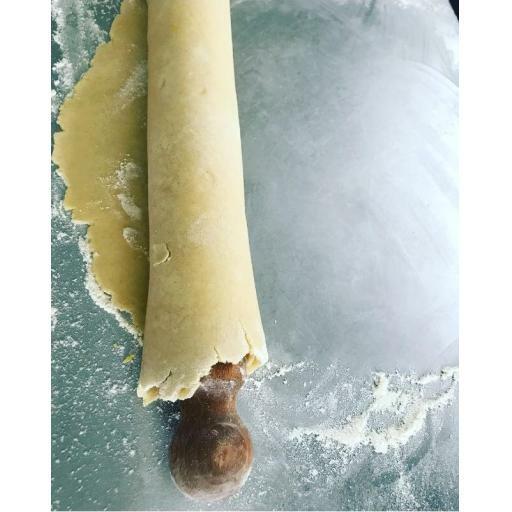 Using a rolling pin, gently roll out the pastry and carefully unroll into the ring. Line a baking tray with baking parchment and put 8 inch ring in the center. Push pastry into the sides, then using scissors cut away most of the overhanging pastry but leave enough to just hang over sides. Don't throw away leftover pastry as you might need it to help seal cracks up later on. Chill in fridge ideally overnight. To make the apple crisps to garnish, thinly slice 2 red apples, using the same amount of water to sugar, boil up to make your sugar syrup and then add your apple slices. Leave in for 1 min until soft and flexible. Pat dry and place on a baking tray lined with baking parchment and place in a preheated oven for about 1 and a half hours. you just want them to dry out. Store in an airtight container. These can be made the day before, along with the pastry. To blind bake tart, cut 4 pieces of clingfilm push down over pastry and pour in rice, baking beans and small pasta shapes. Bake in the middle of a preheated oven at 18 degrees C for 20 minutes. Take out and lift the clingfilm bag. Place back in the oven for 10 minutes to crisp up. If you see any cracks in pastry use leftover pastry to seal up. Set aside to cool. To make the apple puree, core, peel and chop your 6 apples into small pieces. Put into a saucepan and add sugar, a splash of water, lemon and cook until soft. Blitz until soft and add your 2 dsp acv, you can add more if you like a sharp filling but remember you can add but not take out! Let puree cool. To make the custard put 8 egg yolks, 100g caster sugar in a bowl then whisk together. Pour 250ml double cream and 250ml full fat milk, lemon peel, and vanilla bean paste into a saucepan and bring nearly to boil. Place a sieve over the bowl and pour the hot liquid over egg yolks and sugar. Stir together making sure there are no foam bubbles as you don't want that in your tart. Using a spoon fill pastry case up with the puree first making sure you have an even surface, you can use as little or as much as you like. Now carefully pour over custard getting as close as you can as you do not want to disturb the apple layer. Place in a preheated oven at 14 degrees C for 45 minutes, checking after about 35, when ready you can tap the tray and the tart should just wobble. Now leave to cool in the fridge for a good few hours. 30 minutes before serving make the Italian meringue by mixing 227g with 6 tbsp of cold water into a pan making sure you have a pastry brush in water to wipe sides down as it's boiling away! Put on heat and don't stir just let the temperature reach 118 degrees C.
While the sugar mixture is getting to temperature, whisk up the 4 egg whites until they have reached soft peaks, then with the whisk on full power pour in the hot syrup and whisk for a further 10 minutes. The meringue should be shiny and stiff, if it's not whisked for long enough the meringue will shrink as you pipe it. Pipe onto tart any way you wish. Enjoy served with good quality ice cream!